Overview: A taste of win7 on your android devices. its all in one launcher, file browser. A taste of win7 on your android devices. its all in one launcher, file browser. Enjoy the real look and feel of Windows 7 on your Android phone. The real interface HOME SCREEN with all features that are must for a Launcher. It has more features than others available launchers in the market like SPB Shell or ADW Launcher. NO NEED TO DOWNLOAD OTHER FILE EXPLORERS, ZIP APPS OR, Theme or wallpaper applications. It has ALL IN ONE ANDROID 7 APP. You can use this application with any sized LCD, any resolution, any android mobile and tablets! Overview: This is a combination of QQ Launcher and MXHome. It has a lot of features such as some free downloadable theme, animation, etc. If you love ADW, you will love it even much. Extremely Smooth <<< You won't find another launcher which is as smooth as this. Don't trust me? Try it out! This is a combination of QQ Launcher and MXHome. It has a lot of features such as some free downloadable theme, animation, etc. If you love ADW, you will love it even much. Want to know more about it? Head to this site. Launcher has tab to Apps, Music, Pictures and Video. -Added in my own English version as they forgot to patch that in. -Almost every bug is fixed. -List view in app drawer. -Difference sorting view in app drawer is added. -Option to take screenshot in Launcher. -One click cleaner that kill data is fixed. -Folder can be hide in image tab. -Unveil the Dockbar flicking-up the app-drawer button and drop UNLIMITED shortcuts/folders! -Read the changelogs and the application blog. - Now includes a shortcut to launch "Fast Reboots" directly (if you don't want to use the widget). To place a shortcut on your homescreen, long press a free area on the homescreen, select "Shortcuts" and "Perform Fast Reboot"
Pop bubbles to read and reply to messages and calls! · Fixed: in Writer, fix the problem that some encrypted documents can not be opened. · Improved: in Writer, improve the problem of the position offset when users slide the screen to view documents in Page-Layout. · Fixed: in Spreadsheets, the date format can be displayed in accordance with corresponding rules when entering date format like yyyy/mm/dd. · And some other improvements. Overview: Your CPU is under your control. You can choose your frequencies and set the best optimized values for undervoltage and overclock. The main reason for making this application was that I wanted to make application related to OC/UV which will be compatible with all devices which support it, because there are lots of similar applications, but mostly of them are only compatible with some devices. This application should be compatible with the most of devices (maybe with all) which support OC and UV. Your CPU is under your control. You can choose your frequencies and set the best optimized values for undervoltage and overclock. But choose your settings carefully. First test your settings and then after a lot of testing when you'll be sure that you will not have problem, save it on boot. MORE FEATURES AND PROFILES WILL BE ADDED! Overclock and undervoltage can be dangerous to your device. So set it carefully and only on your own risk. I don't have any responsibility for consequences. ★★ My Sketch is the Top Sketch App worldwide with More than 5 Million Users on Iphone , ipad, ipod touch at Appstore , and 10 millions facebook users! ✔ Our Sketch retain the original quality of the Photo without destroying or distorting it. Overview: SwitchMe is a unique application for root users that allows you to log in and out of multiple installations of Android just as you would on a desktop computer. The technology behind SwitchMe saves all of your applications and data, protects it and stores it as a file in memory. You can then log out of an account and log into a fresh installation of Android or another account with its own unique content. You may create as many profiles as the memory is capable of holding. Some of these may require very little free memory because they contain few apps, others will be larger as they contain many applications and lots of cache and data. This application works best on tablet devices with large internal memory cards, so users may experience issues related to applications and their data stored on handset SD cards. Read the help carefully to avoid issues! Why is this functionality useful? Privacy - the most obvious benefit is that you can securely share one device among multiple users, which gives you privacy and peace of mind. Testing - if you are a developer, you can use profiles as clean sandboxes to test your applications and their interaction with the system. Gaming – with multiple installations of Android on a single device, you can now play online MMOs as different characters. Speed - the games your kids play slow down your tablet, but with SwitchMe you can easily create profiles in without games or messengers. Battery life - when the battery is low but there are important emails or documents to edit later, switch to a profile which only contains these essentials. Its critical to understand that incorrect use of this application can potentially harm your device. Before proceeding the use we highly recommend that you perform a full nandroid backup through ClockworkMod or your recovery of choice. Only the standard Android implementation of Apps2SD is currently supported. Most devices with stock rooted ROMs and ROMs based on official builds should be compatible as long as they have enough free internal memory to create secondary profiles. Works perfectly on most CM7 and CM9. Graphical glitches have been reported on MIUI. Stay tuned for new features, and please rate the application by pressing the star button on the main screen - good ratings help us improve and expand functionality! Overview: A Player for Music Lovers. Rocket Music Player was designed with both the easy and advanced listener in mind. The easy to use interface allows you to browse to the music you want to hear faster without getting bogged down in details and extra buttons. Additionally, advanced options give you an opportunity to create your own music listening experience. To take your music listening to the next level, upgrade Rocket Music Player with the Rocket Music Player Premium Unlocker. Overview: NEW! In-App Music Previews: Instantly listen to clips of music you and your friends have Shazam’d. We’ve also given our Tag Result screen a facelift, making it easier to buy, share and learn more about your music discoveries. With Encore you can enjoy unlimited tagging and exclusive features including unlimited tagging, Play in Spotify and Recommendations; as well as all Shazam’s features – identify a track, buy it, check out the video and lyrics, share with friends – and more. Lovin’ that tune? Shazam is the quickest and easiest way to discover more about music. Just hold your phone up to the song to identify the track, buy it, check out the videos, get the lyrics, share it with friends – and more! Pandora is available in US only. Speed improvements: we’ve given our App an extra adrenaline shot so you can identify audio even faster! Bug fixes for crashes reported on Android Market. Overview: The speed and simplicity of Chrome, now on your Android phone and tablet. • Improved appearance on Droid X (and possiblity other, similar devices). • Long-awaited experimental single-percent increments for some (many? most?) devices that previously only showed ten-percent increments. Please see the wiki on the project page for more info, and to report your results. Limited mode should work on more non rooted devices now. Overview: PowerMax - maximize your battery life! PowerMax extends the battery life of your mobile device. Simple to use: just push the button. 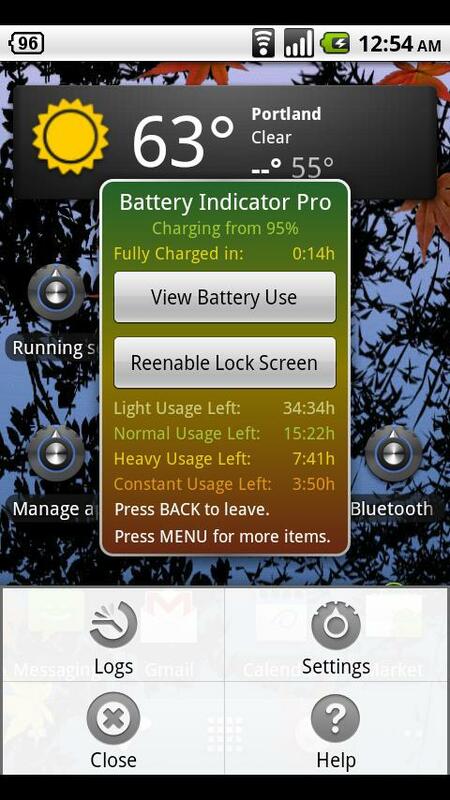 PowerMax is a mobile application that will help you extend the battery life of your mobile device. When you're on the go and notice that your mobile is about to die, or if you know it's going to be a long day until your next chance to charge, turn on PowerMax. PowerMax will save your battery and better manage power usage for you. PowerMax is one of the most friendly and simple to use applications available today. On the main screen there is an On/Off switch. By turning on, the Power Saver will be activated and save your battery, and by turning off, the application will go back to your normal settings. When Power Saver Mode is on, your phone's functionality will be significantly reduced. But don't worry, this is just to save you power, you can always use your mobile's features on demand (email, internet applications etc). In testing we have seen a wide range of battery life improvement – from a mediocre 20% more to an impressive 100% – doubling battery life! Your device usage pattern has a direct affect on the savings – typically the more you use your device the higher the savings you will enjoy. Please note that our reports on the percent improvement in battery life will only start a few days after you install PowerMax. Why? Because PowerMax first learns what is your normal battery consumption, the baseline, and then calculates the improvement. Overview: Fully featured version of the popular AudioManager Widget and Volume manager. AudioManager is an application/widget that allows you to get all of your current volume levels straight from your home-screen. Tap on the widget to adjust volume levels independently. * Available in over 10 different languages. * Create and publish your own skins with the Skin Development Kit. * AudioManager Plug-in available for Locale and Tasker users. Overview: Free 50GB Box.com cloud space, works with non rooted phones! Box.com are giving away 50GB of free space to certain LG Android devices. This app does not require you to have a rooted device in order to edit your build.prop, it will fake the phone type for you. So all android devices can avail of this offer. Just follow these few simple instructions and you will have a massive FREE 50GB box.com account. or here on iPmart on my thread, Box v1.5.1.2, and register for a normal free 5GB account. They will send you a valadation Email, accept this and you will have 5GB free. Install "Free 50GB Box.com v1.1 - redphx.apk" and open it, input your email address and password (I have been assured by the dev of this app that no email address or username, is stored by the app or sent to him or anything like that, but if you are unsure, just change your password after the upgrade to 50GB using your web browser and in account settings). Log into your account, either via the normal Box app or web browser and you will see you have been upgraded from 5 to 50GB!. This offer is to end on the 31st of March, so do not waste time, do it now! Overview: Don't miss what matters most, get notified! Never miss another Call, Text Message, Email or Calendar Event again! **NOTE** Please test the free basic version of this application before purchasing to ensure that it works on your phone. Never miss another Call, Text Message, Email or Calendar Event again! This app is extremely customizable with many options to suit your needs and style. Updates are frequent and new features are added based on user feedback. - Fixed a Dim Screen Background bug. - Added compatibility between Android 4.0 (ICS) Calendars and the Calendar notifications. - Fixed/updated blocked notification user preference. - Fixed/updated incoming notifications being blocked when in the quick reply screen. - Fixed a blocked notification reschedule bug. -Customizable 2 to 10 band graphic equalizer with 3 quality settings. Neutron has sophisticated UI which provides advanced controls for music playback. It is NOT EASY and NOT ANOTHER POP music player, it is developed for audiophiles and those who understand what is music quality. Recommended for use with Hi-Fi/High-End audio hardware. * Surround sound DSP (using Ambiophonic R.A.C.E. technology). * True gapless playback (audio sample accurate). * Looped playback (playlist songs, or individual track). * Real-time 47-band spectrum analyzer. * Landscape and Portrait UI modes. * Minimalistic widget: Neutron Mini. * Task bar notifications of current status. * Playlist: sorting (source, album, artist, genre), shuffling (including looped shuffling), looping, multiple instances. * Album art (supported image formats: PNG, JPG). Linked hardware volume controls to Neutron UI: by default master GAIN slider is now changing hardware gain, to get software GAIN slider (as before) goto Settings -> Audio Hardware -> uncheck HW GAIN. A2DP Bluetooth functionality can be disabled by Settings -> Headset -> A2DP setting, for those who are having problems attaching non-audio BT devices.
! Fixed frequent crash in 1.41.3 update.